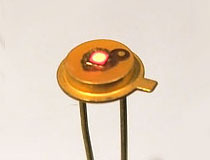 Light emitting diodes were developed as a cheap, reliable solution for both indicator lamps and character displays, and were compatible with the rapidly evolving transistor technology of the 1960s. Though solid state light emission was first observed in 1907 by Henry Joseph Round of Marconi while working on a silicon carbide detector, it would take over 50 years for LED indicators to reach a a state of availability. Subsequent research by Oleg Vladimirovich Losev, Gary Pittman and Bob Biard from Texas Instruments, and Nick Holonyak of General Electric, produced patents and laboratory light sources, but no commercially viable products. It was not until the Monsanto corporation and Hewlett Packard entered into a joint LED development program in the late 1960s that the first commercially mass produced LEDs entered the market. These early devices were extremely dim and quite different looking from a modern LED, but kicked off an industry that would grow to be worth $30 billion by the 21st century. The Monsanto MV1, released in 1968, is considered by most LED collectors to be the world's first commercially produced visible light emitting diode. As can be expected, the MV1 bears only a loose resemblance to a modern epoxy-packaged LED. The semiconductor material is packaged in a gold plated metal can, similar to the TO-18 can packages used for many transistors. 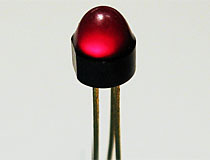 There is no reflector as seen in later LEDs. 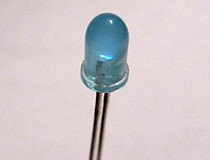 The diode die is mounted directly to a characteristic 'anvil head' contact surface in the bottom of the package, a technique that can be seen in many first generation LEDs. Under magnification, the GaAsP emitting sector can be seen as a circular void surrounded by an upper contact that covers all of the unused space on the top of the die. As expected, the MV1 is a very dim light source, and is barely visible under normal indoor lighting. It should be noted that until relatively recently, many collectors falsely identified this device as a Monsanto MV2. This is inaccurate: the MV2, though packaged similarly, is a green-emitting LED device. The FLV-100 is an early light emitting diode which was designed to be used as a point light source for fiber-optic applications. 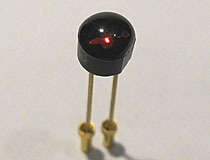 Like many other early diodes, the FLV-100 uses a modified transistor package as the base of its construction. 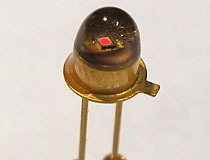 The leadframe and base are identical to a standard T-106 ceramic transistor; the only difference in the package is the use of a clear red epoxy on the upper surface. The FLV-100 die has a very unusual top contact structure, with an oval GaAsP emitter and complex contact shape. 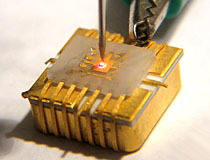 The amount of light emitted by the die is only a tiny improvement over the earlier Monsanto MV1, but it is more than adequate to be detected by Fairchild's companion FPT-100 phototransistor. However, with no diffusion and a narrow beam light output of only 500ucd, the FLV100 was nearly worthless as an indicator. 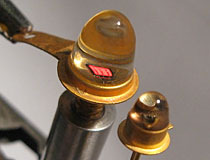 Fairchild's first LED, the FLV-100, was a 500ucd point light source that was nearly useless as an indicator. Fairchild was well aware of this shortcoming and quickly released a modified version of the FLV-100; the FLV-102. 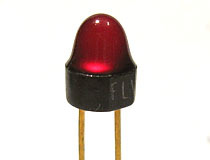 The FLV-102 is identical to the FLV-100 in every respect, with the exception that the clear red epoxy on the top of the transistor header has been replaced with a diffuse red epoxy blob, in a desperate attempt to improve the visibility of the weak light emitted by the LED die. This reduced the viewing angle, the FLV-100 has a view angle of 80 degrees whereas the FLV-102 has a view angle of only 30 degrees. Unlike the FLV100 and FLV101, Fairchild's FLV102 was a commercial success, and enjoyed a hefty production run for an early LED. The light emitted by the FLV-102, at a partly 1mcd, is only marginally easier to detect than that emitted from a FLV-100 and both are easily drowned out by average indoor incandescent lighting. We don't know much about this part, other than that it is a very early device made by HP, and appears similar in outward appearance to the Monsanto MV1 and MV2. The diode has the same gold plated metal can package and 'anvil head' style contact pad as the archetypal Monsanto MV2. 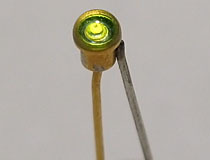 Only when viewed under high magnification do significant construction differences begin to appear: the die in this LED has a substantially different top contact. Unlike the MV1, which has a simple circular contact, the 1842-7329 has a series of 'fingers' which extend into the GaAsP emitting section of the die. The fingers appear to do nothing to help the diode's brightness, as the 1842-7329 is just as dim as other diodes from this era. 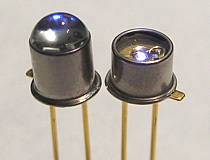 These later three-lead LED devices appear to be modeled heavily after the construction style of the FLV102 and other T-106 package LEDs. It is all in jest however, as the 521-9167 is not built on a T-106 carrier, instead a plastic casting designed to mimic the appearance of a ceramic T-106 has been used as this diode's base. 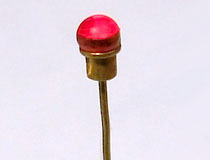 The red lens is also plastic, and is almost surely cast separately from the rest of the diode and then affixed afterwards. It is unknown why a manufacturer would go to such lengths and expense to mimic the appearance of earlier FLV-style LEDs; even the third lead on the device is superfluous, as it serves no electrical function. The brightness on these devices is fairly acceptable; light output is about what one would expect from a mid-1970s 5mm LED. 30 years before Phillips Lumileds became a household name among semiconductor engineers and flashlight fanatics, Monsanto produced what was likely the first attempt at a high power LED; the MV4 and MV4H. Differing only in the shape of the lens, the MV4 and MV4H try to solve the high output LED problem with comic book logic; take an MV1 and make everything bigger. The MV4H package is approximately twice the diameter of a Monsanto MV1, and contains a similarly engorged LED die. The maximum power rating of this LED is 2 watts; inside the die has been secured with three thick bond wires for increased current capacity. Instead of a pair of leads, the MV4H has a large threaded stud, which is designed to be bolted to a heatsink or other metal object to provide cooling. Due to the rarity of this part we were reluctant to test the MV4H to it's full 2 watt rating, but at 50mA the light output from this LED was "almost usable" ... it is certainly not as bright as even the crummiest mid-1970s 5mm LED, but it can at least be seen in a normally lit room. We have been unable to precisely date the release of this part, but given it's low part number, it seems reasonable to believe Monsanto released the MV4H sometime between 1968 and 1970. Special thanks to Patrick Hickey for providing this unusual part. Here is a LED that in outward appearance appears nearly identical to the FLV102 and Dialco 521-9167 LEDs pictured above. This device is of much higher construction quality however. Its T-106 style package is bonded to a clear glass lens and it lacks the superfluous third lead of the 521-9167. The light output is vastly superior to the FLV102 and approaches that of a standard 5mm LED. The manufacturer of this part is unknown. In 1979, Monsanto sold it's LED division to General Instrument, which continued to manufacture many Monsanto LED types under the General Instrument brand. These barely macroscopic components are individual LED dies used for manufacturing early LED displays like the Monsanto MAN-2. Like many bare semiconductor dies, these are truly tiny; each LED die is about three human hairs in width. Dies like this would have normally only been used internally by a display fabrication company, and were never intended to be sold to the general public. Multiple dies are attached to a conductive backing to form lines and characters, and an extremely fine bond wire is connected to the cross-shaped contact on the top of each die to complete the circuit. Note that in the thumbnail photo, a single 321V die has been mounted in a test fixture so it can be activated and made visible. Loose MMH-321V dies are tiny specks of nothing that can barely be seen with the naked eye. This rather primitive looking device is a KL101 LED, an early solid state light source manufactured in the Soviet Union. 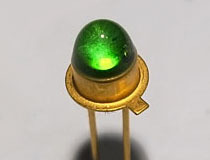 Electronics lore states that the KL101 was one of the first LEDs mass produced in the in the Soviet Union, a believable statement as the KL101 uses a green-yellow silicon carbide die as it's emitter. 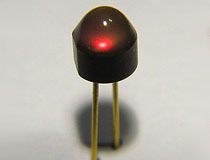 Silicon carbide of this type was typically only used in the dawn of the LED industry due to it's dim light output. The most noteworthy thing about the KL101 however is not its chemistry but its packaging; unlike most early Soviet LEDs which were packaged in robust metal can enclosures, the KL101 is merely a cube of SiC material pressed between two wires and drizzled with epoxy. Though the light output is quite dim, the KL101 is brighter than General Electric's SSL-1 silicon carbide LED, and has a similar light output to the Monsanto MV2. The Soviet Union also made a military variant of the KL101, the 2L101 LED, which had enhanced properties and reliability. 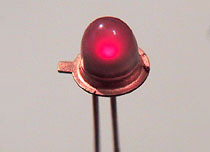 This device is a mundane red LED die in a strange enclosure: a standard TO-92 transistor package. Electronics lore states that Motorola made these parts-of-questionable-judgment under contract for use in camera rangefinders. The existence of such a device stands as a depressing reminder that, at one point in the not-so-distant past, it was actually economically viable to increase the gold content of your product by 50% if it would allow you to avoid changing your package tooling. 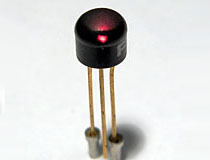 The 3L341V is a de-facto example of a Soviet-made LED. Manufactured in 1989, the 3L341V appears to be standard GaP green chemistry, but is encased in a 1970s-style metal can package with gold leads. The included datasheet indicates that they emit no less than 0.15 microlumens, for implementations where a 0.1 microlumen LED just won't cut the mustard. Needless to say, you won't need special eye protection to handle them. 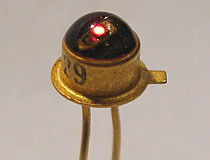 The Soviets manufactured many LEDs which were packaged in metal transistor-style cans, and the AL102A is a good example of such. 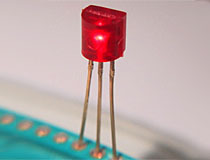 This red LED is housed in a silvery metal package and has a clear lens, allowing easy viewing of the LED die within. The AL102A is rather dim, and is rated for only 0.4 MCD. Based on the low light output and construction style of the AL102A, one can only assume that it is one of the earlier Soviet LED part numbers. 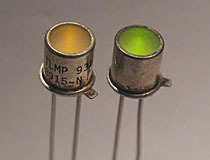 The TLMP 9x10 series of LEDs are metal can, hermetically sealed solid state indicators. Each LED is mounted in a a TO-46 package with a special frosted epoxy fill which provides an even, diffused light. 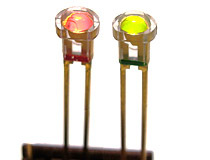 These LEDs are reasonably bright and usable compared to early metal can LEDs like the MV2 and H1, and are comparable to a standard 5mm epoxy LED from the 1980s. We have been unable to exactly date these LEDs, but would estimate their date of manufacture to be in the late 1980s based on their construction style. 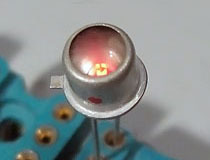 Western Electric produced a number of different types of LED in the 1970s for use in telecom equipment. The 529A & 529B are red and green devices designed for use as panel indicators, and have a distinctive keystone shaped reflector that is designed to poke through a rectangular cutout in a front panel. A series of grooves molded into the back of the reflector produce a distinctive pattern when lit by the relatively weak LED die. 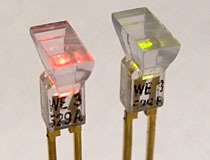 Like many Western Electric LEDs, the 529A & 529B have thick square leads designed for wire wrap connections. A dead end in LED design, straight-pin LEDs are single lead devices that are designed to be mounted directly in a plated hole on a PCB. The single lead is bent and attached to a separate pad on the underside of the PCB, the LED casing mated to the plated PCB hole acts as the other electrical connection. We have no idea who manufactured this particular device, but suspect it was most likely produced by Motorola. Though we do not have a part number for this obscure straight-pin LED, we can say with almost certainty that it is made by Monsanto. The die can be easily seen through the clear epoxy coating and is identical in brightness and construction to the die found in the Monsanto MV1. Unlike the MV1, this LED does not have an anvil head contact. Instead, the die appears to be directly bonded to the 'stalk' single lead which exits the bottom of the device. 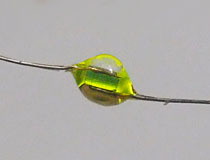 The top bond wire (as well as an errant air bubble) can be readily viewed through the clear epoxy. 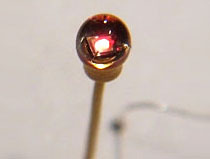 Straight-pin LEDs are a package style that was quickly phased out during the early days of LED production, and as a result were largely only available in red or IR versions. Green is a strange color to find in such a package type, especially a GaP green chemistry die like the one used in this unidentified LED. This LED also has other obvious evidence of its late production...a second lead has been spot welded to the outside of package, which allows it to be inserted into a standard 3mm LED footprint. Unfortunately we do not know the part number or manufacturer for this device. If you can identify the part number for this LED, please contact us. Unfortunately, LEDs do not typically have part numbers printed on them. 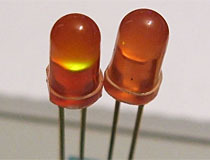 The breadth of unknown and unidentified LEDs is great, and this is yet another anonymous example. In construction this device appears similar to the Monsanto MV1 or MV2, though the die is noticeably brighter. This device also has a significant reduction in gold content: the metal can of the MV1 has been replaced by a shallow metal base. The frosted epoxy construction makes this a much more usable indicator than the MV1, though it unfortunately prevents any microscopic examination of the die. 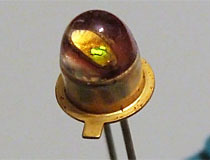 These unusual early LEDs are constructed on a disk of gold covered in frosted epoxy. The example on the left contains a standard early red die, similar in brightness to a Monsanto MV1. 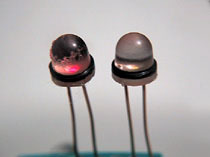 The rightmost example is a rare early attempt at making a usable green LED. The amount of light produced by this early green LED is far dimmer than even the MV2, and can only be seen in a darkened room. Here we have an example of a questionable LED design choice: various attempts to make an orange LED by taking a green or red LED die and burying it in colored epoxy. As can be expected, encapsulating a narrow-band LED in off-color epoxy does little to change the color; these LEDs are useful for little more than comic relief. For 20 years, the color palette of the world's visible light LEDs was limited to a thin band of the spectrum that ranged from red to a sickly shade of yellow-green that not even a semiconductor engineer could love. This all changed in the early 1990's when the first blue LEDs, based on a new formulation of silicon carbide, arrived to form the thin end of a wedge that would ultimately saturate the world of consumer electronics. 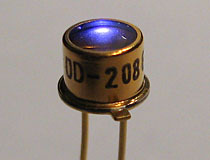 The TLHB5400, made by Telefunken, is an example of one such early SiC blue LED. Like all silicon carbide LEDs, this is a relatively dim device; with a light output of only 1.5mcd the TLHB5400 is suitable only for panel indicators and other similar applications. The LED is packaged in an mundane 5mm epoxy enclosure that would be unremarkable if not for it's distinctive sky blue coloration. Interestingly, the TLHB5400 part number was used by Telefunken for two different LEDs; TLHB5400's made after 1997 use a gallium nitride die with a 428nm peak wavelength, whereas those made prior are equipped with a 470nm or 480nm silicon carbide die. In 1998 Vishay bought out Telefunken and continued production of gallium nitride TLHB5400 LEDs under the Vishay name. The NSHU550, manufactured by Nichia, is the world's first commercially produced UV LED. Released in 2002, the NSHU550 was a dim device, with a peak wavelength of 370nm and power output averaging between 0.5 to 2mW based on bin number. This LED was manufactured in two versions; the NSHU550E which came equipped with a flat glass window, and the NSHU590E, which had a curved glass lens. Initially the NSHU550 was sold through distributors for a unit price of $33.00, and potential buyers had to sign a liability waver for UV exposure as part of the purchase. Despite it's low power and high cost the NSHU550 was a was a technological breakthrough that saw use in many medical and laboratory applications. The earliest NSHU550 LEDs that Nichia manufactured lack the 'E' suffix and are only rated for a 0.5mW nominal power output, versus 1.4mW for the NSHU550E. All of the parts in the family produce a shorter wavelength of UV than that generated by common 5mm UV LEDs, and as such are not safe to view with the naked eye. Not much is known about this mysterious device. In outward appearance this appears to be a metal can UV LED in the vein of the well known Nichia NSHU550 first generation UV LED, but in a gold enclosure with a flat glass lid. The internal construction appears more primitive as well; there is no reflector cup for the UV LED die, and the raised internal platform found in the NSHU550 is missing. This is likely a competing product intended for use in medical devices or waterproof UV germicidal lamps, though the exact manufacturer is unknown. Handwritten paperwork found with these LEDs indicates they have a wavelength of 380nm and an output of 2mW... shorter on average than modern common 5mm UV LEDs. 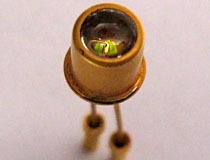 The CEMI CQYP 32A is a Polish-made 4mm green LED with a gold transistor-style package and curved lens - a construction style which is outwardly almost identical to that of early Monsanto LEDs. This device lacks the anvil head mounting found in early Monsanto devices however, and the LED die within appears to be a normal mid-1970s GaP green device of average brightness. 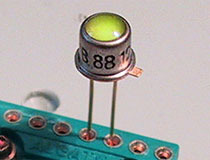 The LED die is installed in a small reflector cup, similar to the type used in modern LEDs, and is covered with a transparent green epoxy lens. CEMI also produced a red version of this device; the CQYP 40. The CQYP 40 is outwardly identical to the CQYP 32A, with the exception of it's red LED die and epoxy lens. Special thanks to Zygmunt Flisak for identifying this obscure device. Yet another anonymous early LED part number, this strange device appears to represent the minimal amount of epoxy that can be used to encase an LED and still retain functionality. Little more than a bare die mounted to a gold transistor header, a thin dome of epoxy has been painted across the top of the device, providing a degree of protection for the ball-bond wire. Light output from this device is quite dim, barely more than that generated by a Monsanto MV1. We have been unable to determine the part number for this device, but suspect it was most likely manufactured by Phillips.